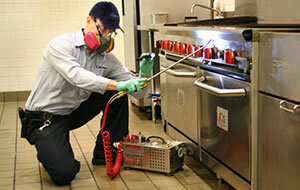 Maintaining a pest-free facility is essential to the success of every Hotel, Motel, Inn, and Apartment Complex. Spiders, ants, rodents, and bed bugs are the most common pest problems affecting the hospitality industry. MATRIX can eliminate even the most difficult infestations, with fast, effective, non-toxic hotel pest-elimination services. Contact us to find out how we can help you get rid of infestations and keep your business pest free. BED BUGS – Don’t let ‘em bite! Bed bugs can be a particularly serious problem for Hotels, Motels, and Inns. Bed bugs like to hide in the seams, joints, and cracks of mattresses, baseboards, upholstered furniture, bed frames, and behind headboards and other cracks and crevices in the room. Bed bugs feed only on blood and can survive up to a year without a meal. Conventional methods of eliminating bed bugs, including discarding or destroying your furniture and carpets, are obviously not a practical solution for lodging businesses. MATRIX has a comprehensive solution to the bed bug problem. Go to our bed bug page to learn more. MATRIX will deliver a professional 45 minute certification program to your hotel staff, educating them on how to identify and ultimately rid your property of bed bugs…FREE OF CHARGE! Find out more about how Matrix Pest Elimination can put an end to your pest problems. Contact us today! Apartment buildings are common sites for spider, ant, cockroach, and rodent infestations. Matrix Pest Elimination can help, with services that get rid of all types of pests quickly and effectively. We start by examining problem areas in your building to determine exactly where pests live and breed. Then, we apply only the safest, greenest formulas, using our own carefully developed methods to rid your spaces of pests and help keep them pest free.